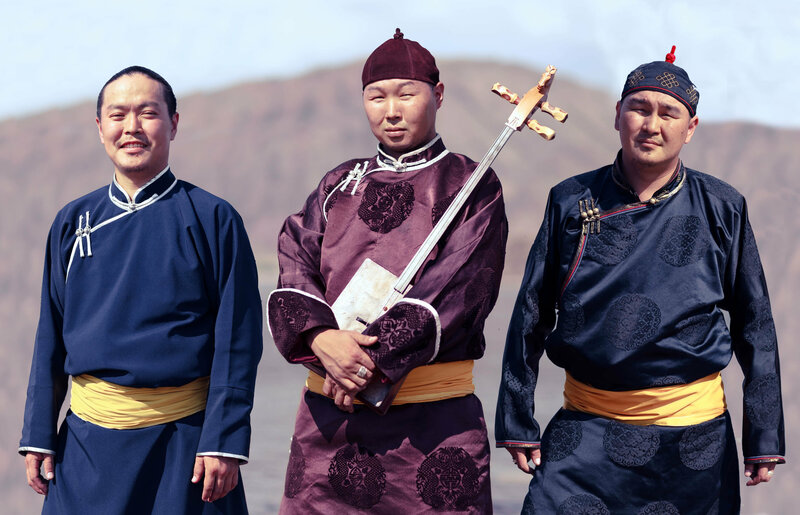 The Eli and Edythe Broad Stage in Santa Monica presents a rare performance by Alash, a trio of master throat singers from Tuva, a tiny republic in the heart of Central Asia. Grounded in tradition while expanding its musical vocabulary with new ideas from the West, the ensemble and its individual members have consistently won top honors on the highest stages. Tuvans boast a musical identity all their own, featuring a vocal tradition that has put them on the world-music map: throat singing. The Alash Ensemble honors that heritage with a modern twist. Its influences include all the modern throat singers, but also American innovators such as Jimi Hendrix and Sun Ra. Click here to hear a demonstration of the different Tuvan Throat Singing styles. Trained in traditional Tuvan music since childhood, the Alash musicians studied at Kyzyl Arts College just as Tuva was beginning to open up to the West. They formed a traditional ensemble and won multiple awards for traditional throat singing in international xöömei competitions, both as an ensemble and as individuals. They have borrowed new ideas that mesh well with the sound and feel of traditional Tuvan music, but they have never sacrificed the integrity of their own heritage in an effort to make their music more hip. Alash first toured the U.S. under the sponsorship of the Open World Leadership program of the Library of Congress and the National Endowment for the Arts. They appear as guest artists on Béla Fleck & the Flecktones’ holiday CD Jingle All the Way (2008), which won a Grammy. The Denver Post remarked, “As electrifying as the Flecktones’ performance was, the band were nearly upstaged by Alash Ensemble.” Since Alash’s first partnership with the legendary Sun Ra Arkestra, they have collaborated with musicians across the spectrum, from country to classical to jazz to beatboxing. Most recently, the jazz CD The Viridian Trio (2017) features Alash in a musical remembrance of the late Kongar-ool Ondar­­. Beyond performing, Alash has a passion for teaching and promoting understanding between cultures. Their tours often include workshops where they introduce Tuvan music to students from primary, middle and high schools, colleges, universities, and music conservatories. Children as young as 8 and 9 have learned to throat-sing. Sean Quirk: interpreter and manager. Studied music in Tuva on a Fulbright fellowship. Named Distinguished Artist of Tuva, 2008. In addition to The Broad Stage, The Edye, our 100-seat black box theater, presents new, developing and innovative work in theatre, music and dance as part of our Under the Radar Series, as well as offerings from our other genres. Featuring younger, emerging artists, chamber pieces and plays, programming at The Edye reflects the dynamic nature of the space and allows for the latest, most exciting artists to be booked on short notice. The Broad Stage’s Education and Community Programs offer opportunities for cultural exposure through various student events.